What Day Of The Week Is November 23? 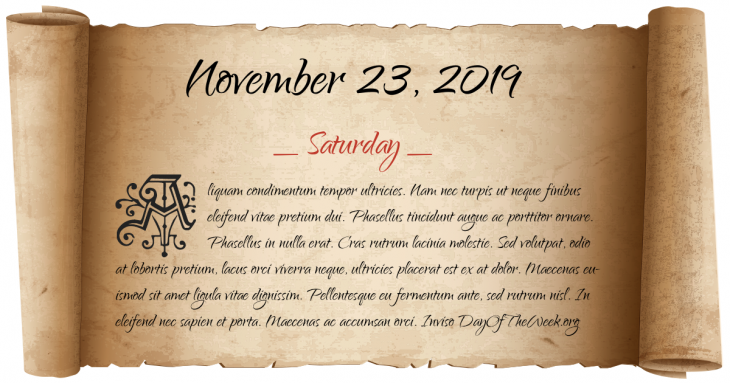 November 23, 2019 is the 327th day of the year 2019 in the Gregorian calendar. There are 38 days remaining until the end of the year. The day of the week is Saturday. The Second war of Kappel results in the dissolution of the Protestant alliance in Switzerland. John Milton publishes Areopagitica, a pamphlet decrying censorship. French Navy fire in Hai Phong, Viet Nam, kills 6,000 civilians. The Cocos Islands are transferred from the control of the United Kingdom to Australia. The Convention on Cybercrime is signed in Budapest, Hungary. A series of bombing kills at least 215 people and injures 257 others in Sadr City, making it the second deadliest sectarian attack since the beginning of the Iraq War in 2003.
Who were born on November 23?